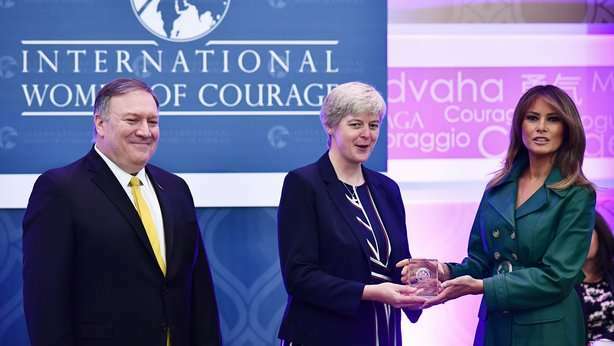 On March 7 the U.S. Department of State hosted the 2019 International Women of Courage (IWOC) Awards to honour 10 extraordinary women from around the world. This year, our very own Loreto Sister Orla Treacy ibvm was nominated and awarded this prestigious award by the U.S. Secretary of State Mike Pompeo and First Lady Melania Trump. All connected with the Loreto Australia and South East Asia Province delight in this massive honour conferred on Sr Orla in recognition of her courage in establishing schools and welfare support for girls and young women in war ravaged South Sudan. She was nominated by Callista Gingrich, Ambassador to the Holy See, on a recommendation from the De La Salle Brothers whom recently started a school in our community. During the ceremony, Naw K’nyaw Paw of Burma, spoke on behalf of all the women being awarded, telling her story of courage, and ending with a poem which reflected on the fact that women of courage prepare the way for others to be brave and to fight for a better world. When asked about the award, Sr Orla said, “This award belongs to the young women of South Sudan with whom I have the privilege of working. Our students embody all that is courageous – they are young women of vision, strength and hope. Young women who dream of a better country for themselves and their families, who are prepared to challenge old structures and work towards making South Sudan great. I am grateful to all who have made this possible. In 2006, Sr Orla joined other Loreto Sisters who were starting a new mission in Rumbek, South Sudan. Touched by the plight of girls who were being forced into early marriage and denied the right to an education, she took action. Sister Orla and the Loreto Sisters started a girls-only boarding school with 35 students. The mission is currently supported by two additional Loreto Sisters – Sr Penina from Kenya and Sr Baida from India. Sr Orla was accompanied at the ceremony by her father, Blaise Treacy, brother, Eamon Treacy, fellow Loreto Sister from Bray, Ireland, Sr Anne Mary Murphy ibvm, and Candacia Greeman representing the staff and students of Loreto Rumbek. Her father noted, “I was very privileged to be present and I am very proud as a father,” while her brother spoke of how proud their mother would have been to see Sr Orla honoured in this way. Sr Anne Mary ibvm, who previously served in the Loreto Rumbek mission spoke of the impact of the ceremony. “I was really moved to see so many women from all over the world – from so many cultures being honoured. What really struck me was the fact that these women were representing the many other women who work hard serving the vulnerable. I was also thinking of our girls in South Sudan who are setting out to do something great – preparing to work hard for their country,” she explained. The Loreto community stands in awe of Sr Orla’s colleagues and students as they commit to a future full of hope – a future of educated poised and passionate Sudanese women. Mary Ward International Australia provides ongoing funds to Loreto Rumbek and welcomes your support. Join us today in helping women and children reach their full potential. Video: Sr Orla shares her insights about the work she undertakes in South Sudan.